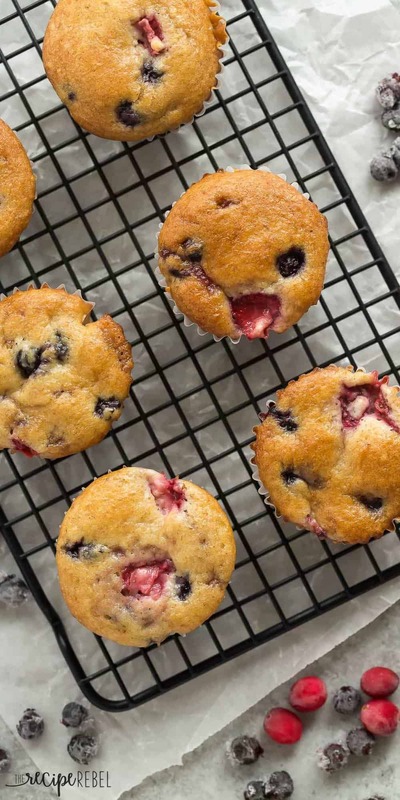 These Fruit Explosion Muffins are loaded with strawberries and blueberries (or any berries you want!) and have a strawberry jam surprise inside! They are made with whole wheat flour and sour cream makes them extra moist. These muffins have been on my To-Make list for a long time now. I wanted to come up with a Fruit Explosion Muffin recipe that would rival that of Tim Horton’s, but maybe be a little healthier and made from scratch. The problem is, I rarely experiment with muffin recipes. I have a couple that I like and make all the time: these Double Chocolate Banana Bran Muffins and these Banana Chocolate Chip Zucchini Muffins. And that is pretty much where the list ends. I don’t know why — maybe it’s because I find muffins a little finnicky. It’s so easy to overmix or not add enough moisture, and then you have dry, crumbly muffins. Sometimes they stick to the liners and you’re just not sure why. And sometimes you just want to pour everything into a loaf pan and bake without the hassle of scooping into muffin tins. But muffins are so great because they freeze perfectly, and you can pull out just one at a time. 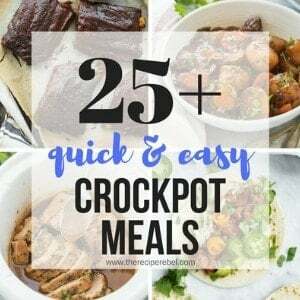 Awesome for school or work lunches! I based this recipe off of the Berry Cream Muffins from Taste of Home, which is in one of my Taste of Home cookbooks. But beside the recipe I had written “so-so” — a note to myself from the first time I made them so I made a few changes and I am so happy with the result! Finally, I have another recipe to add to my muffin list. I made these a little healthier with whole wheat flour — feel free to use all-purpose if you desire. Feel free to swap out the berries for other berries or different fruit, and same with the jam or jelly. The options are endless! 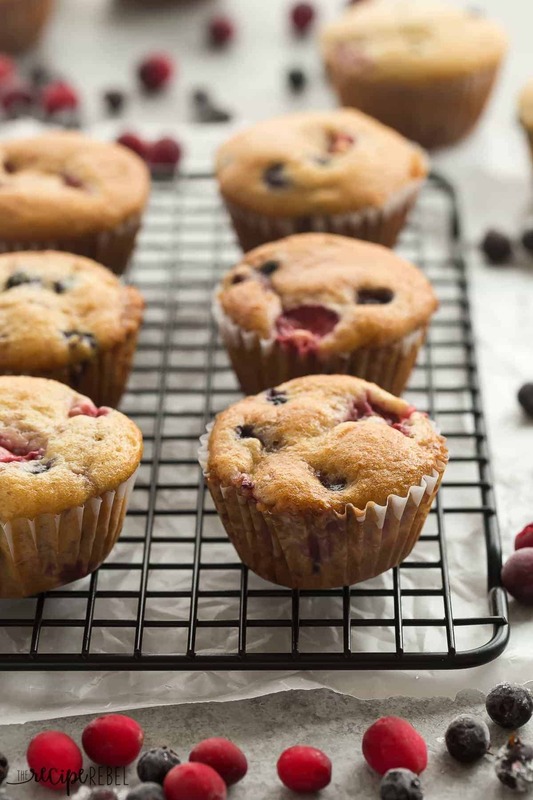 Be sure to bake them until golden brown — the frozen fruit slows down the baking process slightly so you want to make sure they are completely baked! 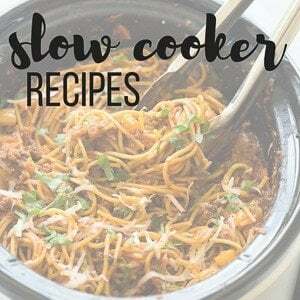 *I have updated the recipe since posting after receiving feedback from a couple of readers — I made a couple changes to make them extra moist and extra flavorful. I increased the amount of berries, vanilla, and added in some unsweetened applesauce for moisture and sweetness, among a few other changes. 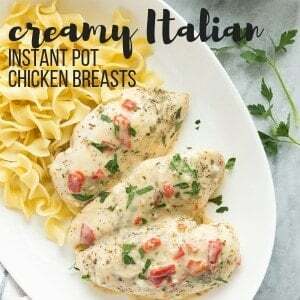 If you’ve made the recipe before, note that it is now a bit different but the changes I made make them even better (more moist, more flavorful!) than before. 3/4 cup jam or jelly nothing too runny! Preheat oven to 350 degrees F and line 3 muffin pans with paper liners or use non-stick pans and grease lightly. You can also use silicone pans, though they will not brown as usual. In a large bowl, combine sour cream, oil, applesauce, eggs and vanilla with a whisk. Stir in sugars until combined completely. Add flours, baking powder, baking soda, and salt and stir just until combined. Fold in berries. Spoon 1 tablespoon of batter into the bottom of each liner, spreading it cover the bottom completely. Top with 2 teaspoons of jam and cover with remaining batter (about one heaping tablespoon per muffin cup), covering the jam as best as you can. Bake for 23-25 minutes (I bake mine exactly 25 minutes), until golden brown, toothpick comes out clean and batter around berries appears set. Cool to room temperature and serve. May be stored at room temperature for 2-3 days or frozen for 3-4 months. If you're using raspberries, I recommend frozen because they will get squashed when stirring. Strawberries, blueberries, and cranberries should be fine either fresh or frozen (though frozen will be stirred in more easily and won't discolour the batter as much). Where is the applesauce added in???? These look/sound amazing. Can’t wait to try them. Any advice on cutting the recipe in half? Hi Jackie! I have never tried, but they do freeze perfectly if you end up making the whole batch! Fruit explosion muffins at Tim Hortons are my favourite. I can’t wait to try these! Hi I have tired these muffins and can say that they are delicious and easy to prepare. My husband and my grandchildren beg me to make more and more……thanks for a great recipe that is fun a d healthy. The measurements and yield is all listed in the recipe box above. The recipe uses 2 cups of whole wheat flour and 2 cups of all purpose flour (or 4 cups all purpose flour), and it yields 36 muffins. Does the recipe really call for 4 cups of flour? I only see two. I don’t want to make it wrong! 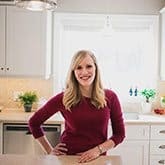 I am looking for muffin recipes to make ahead for a baby shower. If I freeze these, how far in advance would I need to take them out of the freezer to thaw and should they be thawed at room temperature or in the fridge? They can be thawed at room temperature or in the fridge, and they should be thawed in 2-3 hours in the fridge or maybe 1 hour on the counter. This made me smile because I remember when we went to Canada, we would head to Tim Hortons in the afternoon and get a chocolate milk and a donut for like $2! We loved it. These muffins look incredible – pinning! I totally remember those Timmy Ho’s muffins, and these look even better! The best kind of surprise ever! 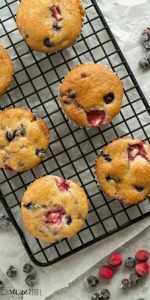 These muffins are SO fun, and they’re really getting me in the mood for spring! I’ve never seen muffins quite like these before and I’m really intrigued! These are on the must-try list! Thanks Marcie! I’ve got a hankering for another batch! I have a weird love-hate relationship with muffins. Like, I love to eat them on the regular, but there are many days I don’t feel like the hassle of making them. Sometimes I’m lazy, what can I say?! 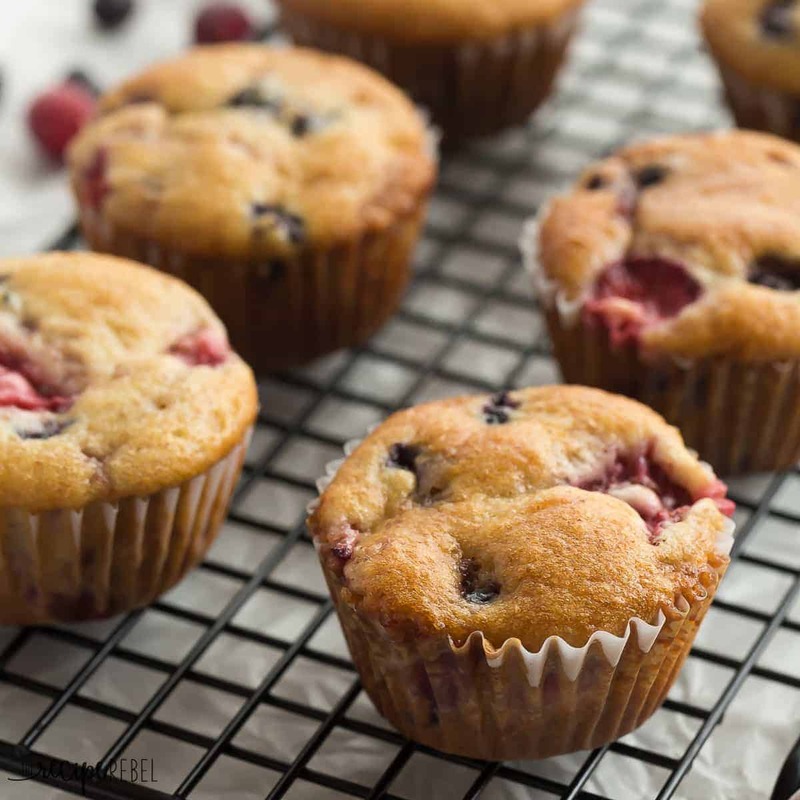 BUT I’ve been on a muffin making kick recently, so these berry-licious beauties could NOT have come at a better time! These look amazing, Ashley! LOVE that jam surprise center and ALL the berries up in here! Absolute HEAVEN! I’ll take a dozen. 😉 Pinned! Cheers! Oh TOTALLY. I hear you. And these? With the extra step of the jam in the center? They’re a special occasion muffin here for sure ! (Or a “mom’s actually got an hour to bake” for fun kind of muffin). But they’re totally worth it! 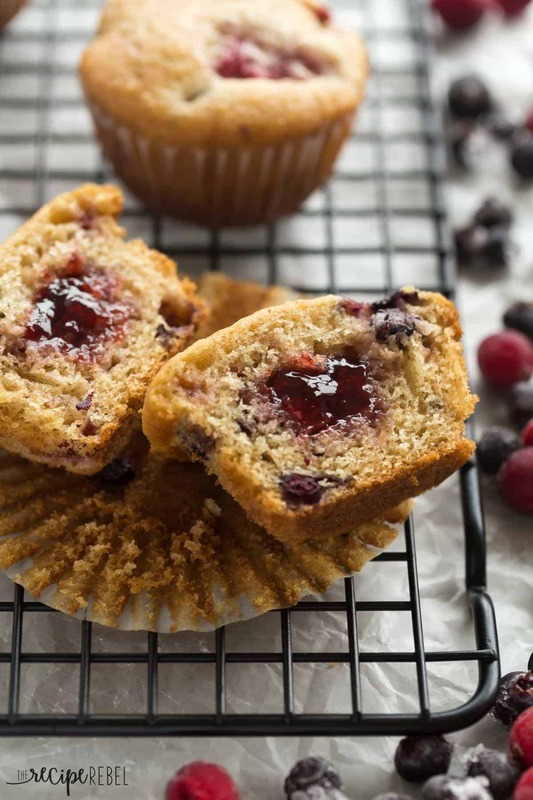 I love a good muffin jam-PACKED with berries! These are seriously looking SO moist and amazing to me, Ashley! I could eat all of these for breakfast with my coffee right now! I love making muffins! There are so many varieties and ways to do so…I would have a muffin blog if people wouldn’t get bored of it haha! These fruit muffins are calling my name, Ashley! We don’t have a Tim Horton’s around here, but I love the sound of them. Perfect for a breakfast or snack!